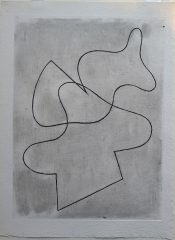 Jean Arp, otherwise known as Hans Arp, was born in 1886, in Strasbourg. In 1904, after leaving the Ecole des Arts et Métiers, Strasbourg, he visited Paris and published his poetry for the first time. From 1905 to 1907, Arp studied at the Kunstschule, Weimar, and in 1908 went to Paris, where he attended the Académie Julian. He moved to Switzerland In 1909, and became a founder of the Moderner Bund group in 1911. The following year, he met Robert and Sonia Delaunay in Paris and Vasily Kandinsky in Munich. Arp participated in the Erste deutsche Herbstsalon in 1913 at the gallery Der Sturm, Berlin. After returning to Paris in 1914, he became acquainted with Guillaume Apollinaire, Max Jacob, Amadeo Modigliani, and Picasso. In 1915, he moved to Zurich, where he executed collages and tapestries, often in collaboration with his future wife Sophie Taeuber (who became known as Sophie Taeuber-Arp after they married in 1922). In 1916, Hugo Ball opened the Cabaret Voltaire, which was to become the centre of Dada activities in Zurich for a group that included Arp, Marcel Janco, Tristan Tzara, and others. Arp continued his involvement with Dada after moving to Cologne in 1919. In 1922, he participated in the Kongress der Konstruktivisten in Weimar and the Exposition Internationale Dada at Galerie Montaigne in Paris. Soon thereafter, he began contributing to magazines such as Merz, Mécano, De Stijl and later to La Révolution surréaliste. Arp’s work appeared in the first exhibition of the Surrealist group at the Galerie Pierre, Paris, in 1925. In 1926, he settled in Meudon, France. In 1931, Arp was associated with the Paris-based group Abstraction-Création and the periodical Transition. Throughout the 1930s and until the end of his life, he continued to write and publish poetry and essays. In 1942, he fled Meudon for Zurich; he was to make Meudon his primary residence again in 1946. The artist visited New York in 1949 on the occasion of his solo show at Curt Valentin’s Buchholz Gallery. In 1950, he was invited to execute a relief for the Harvard Graduate Center in Cambridge, Massachusetts. In 1954, Arp received the Grand Prize for Sculpture at the Venice Biennale. A retrospective of his work was held at the Museum of Modern Art, New York, in 1958, followed by another at the Musée National d’Art Moderne, Paris, in 1962. Arp died June 7, 1966, in Basel.